Death Dealers has a great history on TrackBase. 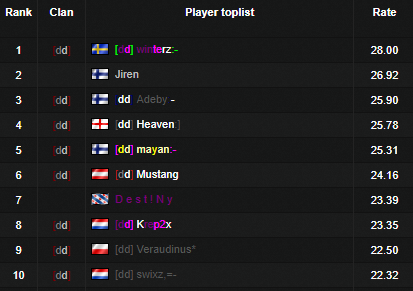 In the beginning of 2013 we were #1 in rank and skillrank, with over 10 members on the page. Unfortunately the clan died due to inactivity. We have since then re-opened and are doing better than before with members and activity! * We are only looking for real aimers and fraggers. All [dd] members are on our clanpages, others aren't to be associated with us! Old members are always welcome!